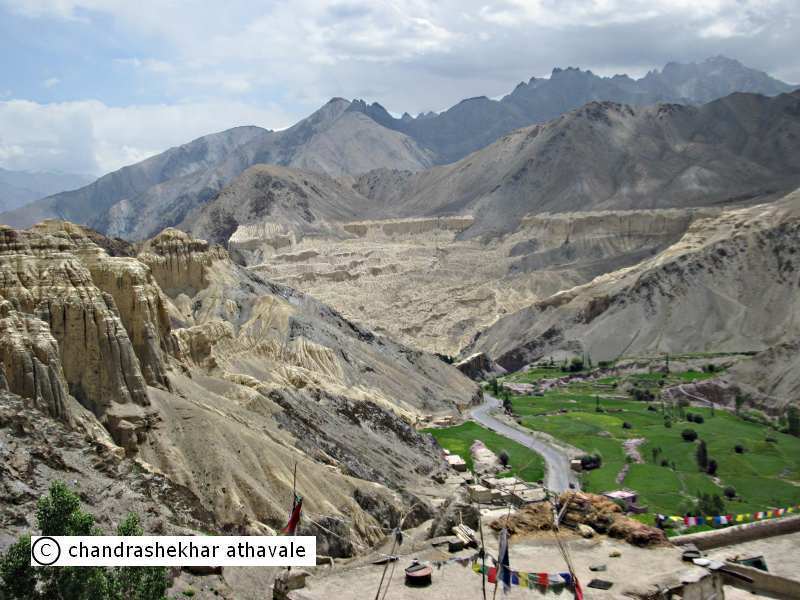 There are three ways in which one can arrive in Leh. There is a road which connects Manali in Himachal Pradesh state of India to Leh via Rohtang Pass. Alternatively a road from State capital Srinagar, (Jammu & Kashmir State, India), connects to Leh via Zoji La, Drass and Kargil. 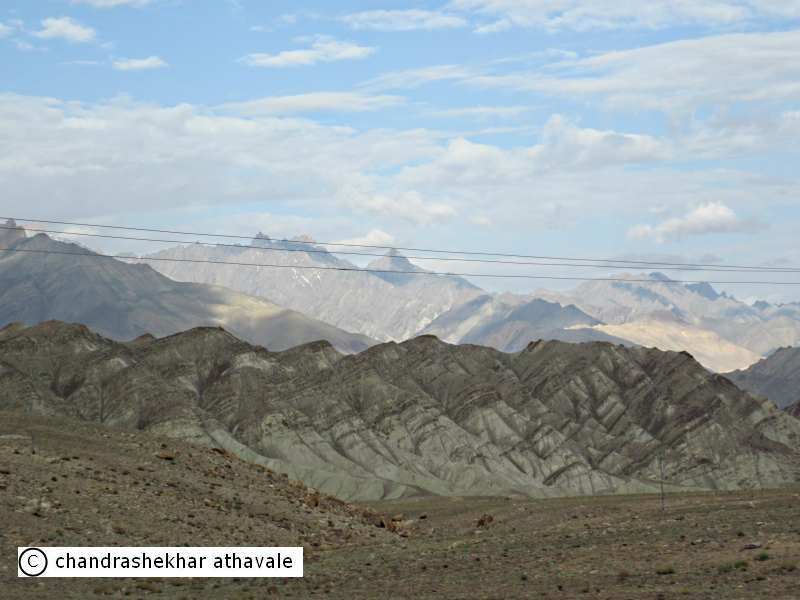 It takes minimum two days of crowded bus travel to reach Leh by any of these two routes. The third way is obviously to fly in from Delhi directly. Many people prefer to come by road. 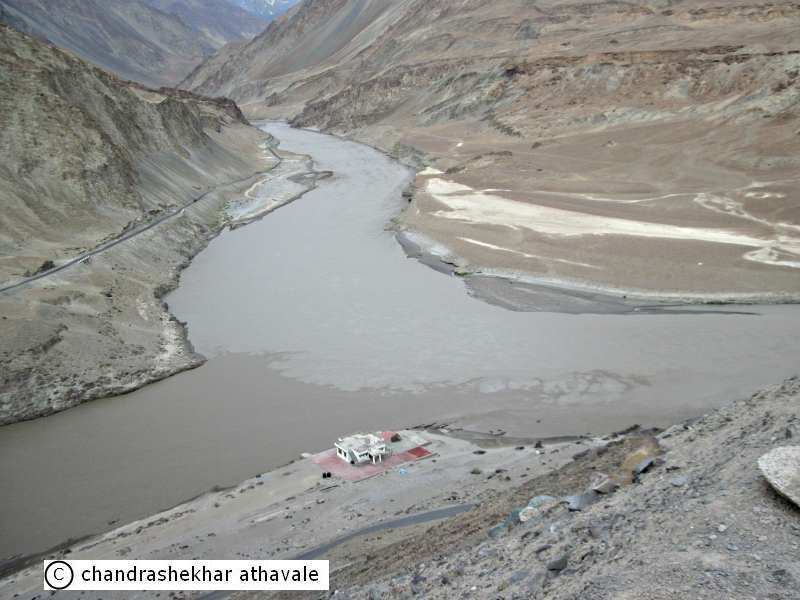 The advantage here is that you get acclimatized, while on your way to Leh. I preferred to fly directly from Delhi because firstly I hate such long road journeys by bus and secondly I wanted to spend maximum of my time travelling in Ladakh and not travelling to Ladakh. 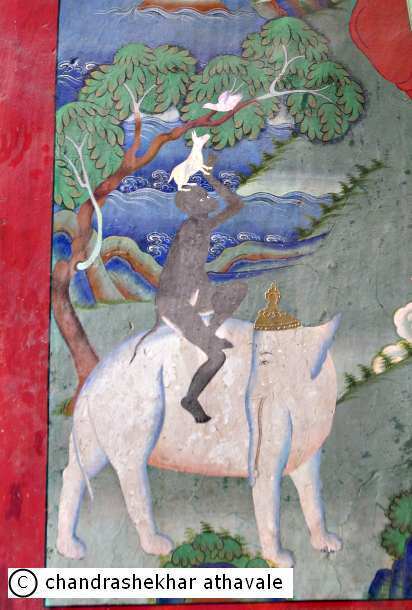 My plan for today is to travel to the village of Lamayuru, to visit the Monastery there. 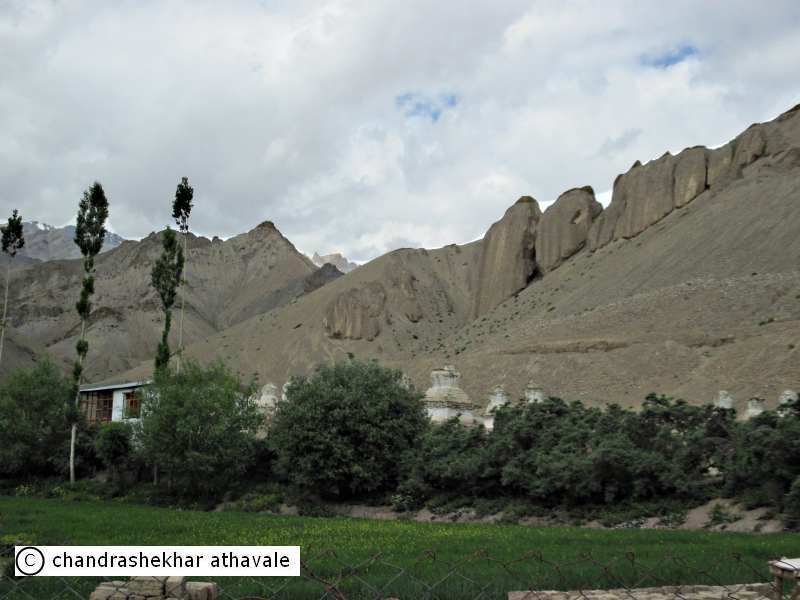 The village of Lamayuru is situated about 100 kilometers from Leh on the main Leh- Kargil road between Khaltse town on the Indus river and Buddhkharbu town. 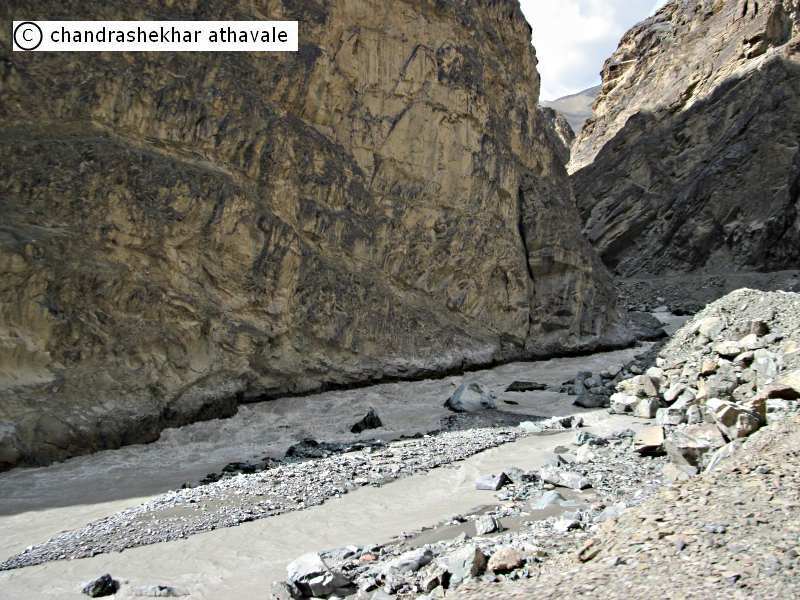 In fact this road is now preferred to the old Leh-Kargil road, which was all along the Indus river and passed through Batalik, because it is much safer. 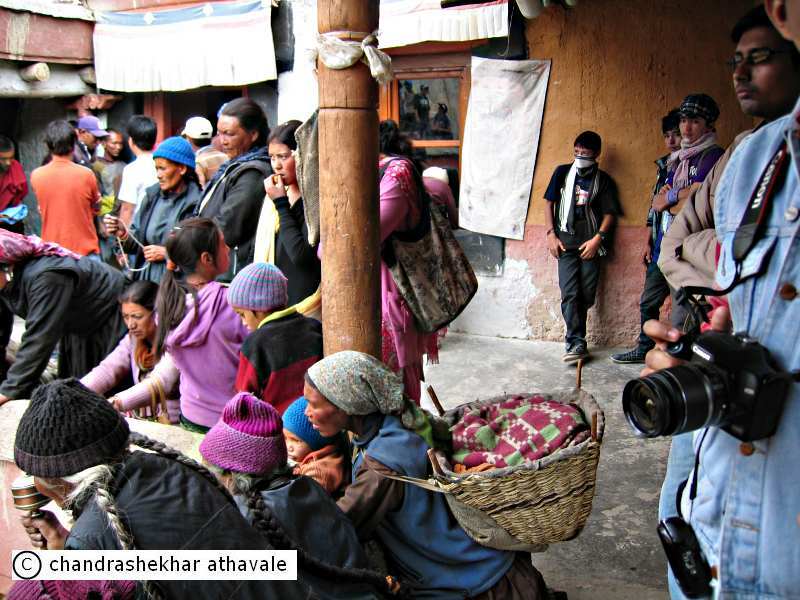 People who come in to Leh from Kargil, anyway travel through this village, but seldom stay there. They just have a cursory glance at the monastery and leave. My plan is to stay in the village. 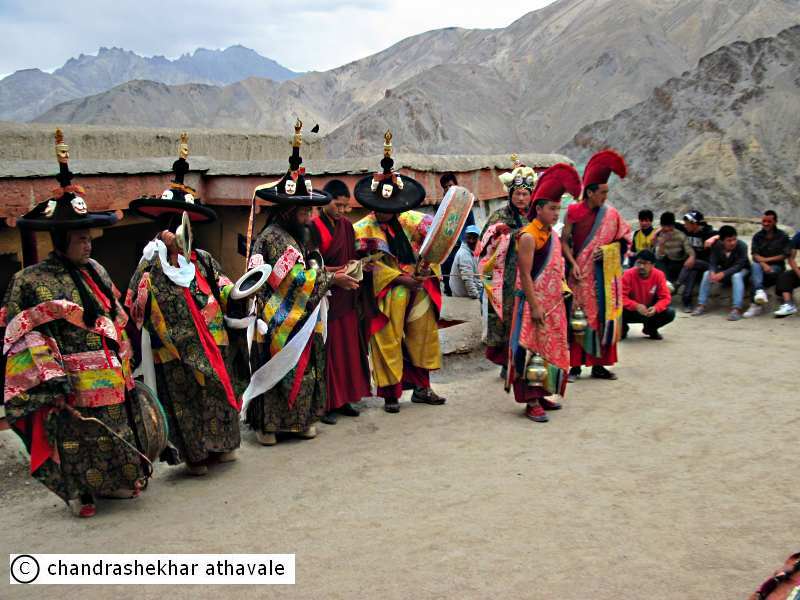 My travel agent belongs to this part of Ladakh and has suggested that if we leave early from Leh, we could be in Lamayuru before noon, to watch the annual Pooja ceremony at the Monastery, performed on the day after the yearly festival. This is the reason for my plan to leave Leh town early in the morning. I manage to get up early with a slight heaviness in my head. I just pop up half a tablet of Paracetamol and forget about it. Since Leh has a permanent and perennial power problem, most of the hotels provide hot water heated by wood fired boilers. This means that hot water is available at a fixed time and only for a short interval. Luckily, I find that there is hot water available today at 5 AM. I get ready but the driver and the vehicle fail to arrive at stipulated time. Besides, the packed breakfast, which my hotel had promised to keep ready at 5 AM, is still not ready. There is no way in which I can speed up things. I just relax and enjoy the beautiful morning weather. Eventually, my vehicle and the driver arrive. He has a frown on his face and is not very willing to help. Only last evening, I had heard him lecturing someone, about importance of keeping time. I ask him about the delay, he just laughs in a sarcastic fashion. I collect my packed lunch and finally we are off to Lamayuru. We pass the huge base hospital built by the army for fighting men and a power station which only supplies power to this hospital. We turn round the airport and join the Leh-Kargil highway. This area is known as Spituk and on both sides of the road, only thing that I can see are the vast campuses of various Army units stationed in this area. The terrain ahead is now turning hilly. The hills however look quite different here from what I have seen anywhere else and weird. Hills here have a peculiar grayish, yellowish colour. Some of the hill slopes, taper off so gently and smoothly, that even a pebble launched from the top, would come rolling down with speed. On some of the slopes there are deep sharp ravines and strange shaped rocks stand, sit or lie down, as per viewer’s perception. On some of the hills, I see a plethora of small pebbles and rocks of all kinds and sizes, strewn all over. We pass through miles and miles of this mesmerizing monotony. when my mind is getting convinced that what I see around is nothing but a full fledged desert, I suddenly see ahead lush green grass and hundreds of poplar trees with small brooks passing through. 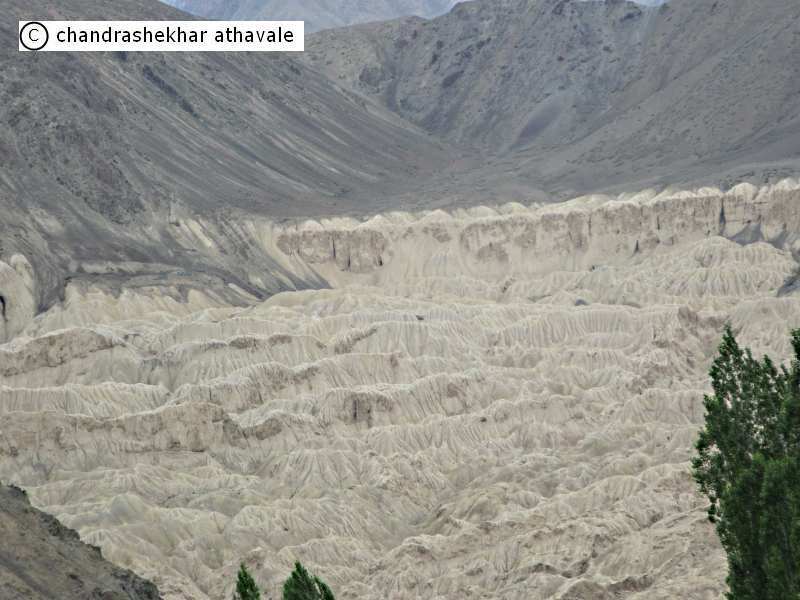 This is the beauty of Ladakhi landscape. At one instant, all that you can see around you is just hot and dry desert land. You take a turn and suddenly you find yourself surrounded by lush green thick foliage, reminding you of tropical lands. The car takes a sharp turn. 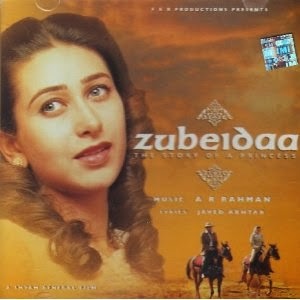 The driver announces that River Sindhu or Indus is on the left. We are probably forty to fifty feet above the river bed. I ask the driver to stop and get down. As I stand on a side of the road, facing this greatest river, cherished by all Indians, my mind passes through a spasm of uncontrolled emotions. This is the River that has given her name to our religion known as Hinduism, her name for our land, known as Hindustan and yet I had to travel thousands of miles to reach a far off corner of India, just to see this river. 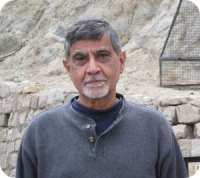 Perhaps my mind has already connected to some long back ancestor, who having braved the terrain and the deserts of the Persia and Afghanistan, has just descended through an equally rough terrain of Bolan Pass (Near Quetta city of present Pakistan) some nine or ten thousand years ago, to a fertile river basin, full of forests and game to hunt. I keep looking at this river with the same wonder and amazement that he must have felt then. We move on. The terrain keeps presenting ever changing appearances and I find myself short of words to describe it. 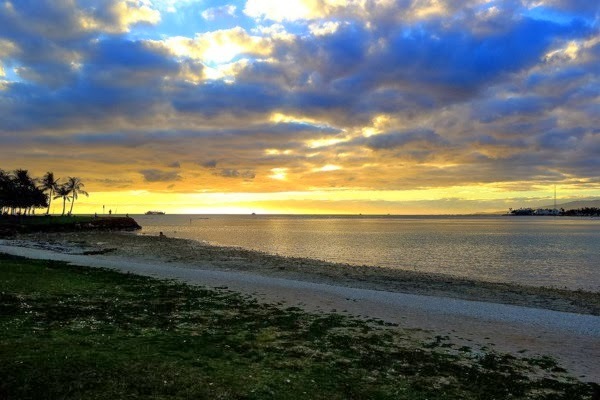 No amount of filming or photography can store in a photographic image or series of images, this absolutely stunning landscape of infinite dimensions. I suddenly become aware that each and every mountain I pass by, has a different hue and shade of colour, subtly mixed in the basic tinge of grayish, yellowish colour. Some greenish, some yellowish, some have a red tinge and some look purple. Yet there is no order of colours. You never know what would be the hue and tinge of the next hill or a ravine. My college day chemistry reminds me that this is nothing but abundance of some salt of chromium or iron or sulfur that is giving this tinge to the mountains. Yet I find it impossible to conceal my childish sense of amazement at every turn and corner of this vast glory of a landscape. The car starts climbing up a hill. When we reach a top of sorts, driver stops the vehicle, There are many multicoloured flags fluttering violently in the wind, by the road side. I cautiously approach the edge of a steep mountain slope. Some two or three hundred feet below me, I see a sight, which would remain permanently etched in my memory. 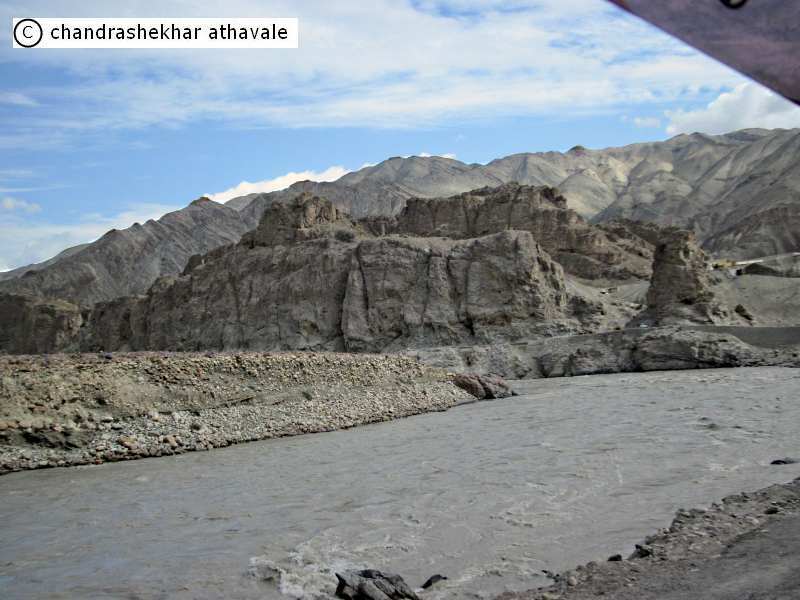 The river Sindhu or Indus, which is flowing from my left, meets here another major river of Ladakh, River Zanskar. This is the confluence of these two great rivers. The enormous volume of water that moves ahead is of little use to this hilly land with deep ravines or it’s people. The water is being collected here by nature, to be sent ahead to people of Pakistan, staying in the flat lands of the south-west for their prosperity and well being. We reach the town of Nimo and decide to break for Tea. The scene here is not much different than what one can see around breadth and depth of India. Rugged Tata trucks, smell of diesel and burnt oil, tough looking drivers, roadside shacks serving hot and sweet, milky Tea. I remember the grilled sandwiches packed by the hotel for me. The extra sweet Tea somehow goes well with the cheese sandwiches I have. We pass more villages on way. The river keeps on changing its appearance every mile. It looks like a quiet mass of water just merrily floating along at one place but would turn into a gurgling, splashing mass of dirty whitish water, just few miles ahead, a heaven for the rafters. I see many of them travelling on the road with their rafts loaded on the roofs of their SUV’s. Small lush green villages appear suddenly on the sides with giant sized Gompas and statues of deities. Every minute, the river is becoming bigger and wider. 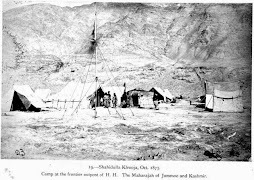 We reach the town of Khaltse. 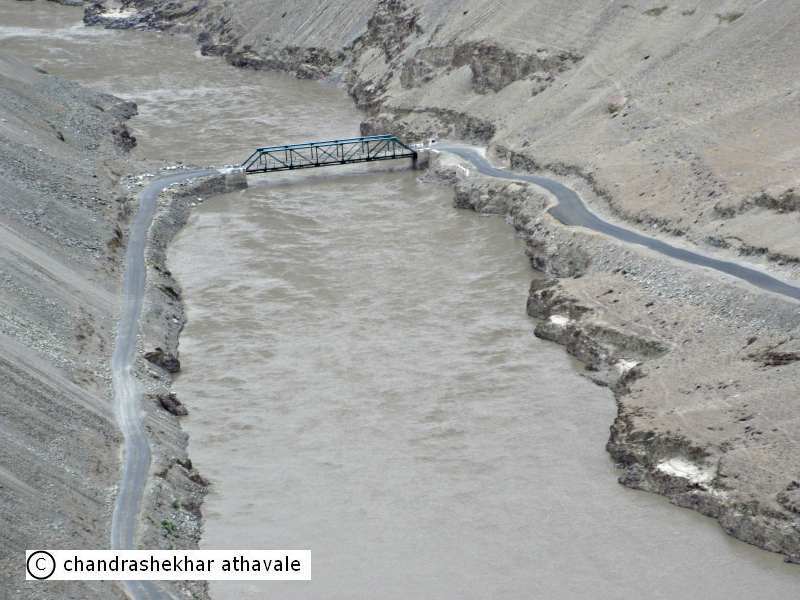 The old Leh-Kargil road goes straight ahead alongside the river. We are turning to take a new road , which also goes to Kargil but via Lamayuru, our destination today. We cross the river on a temporary iron bridge built by Army Engineers. Having parted from the river, the terrain now becomes even more like a desert, yet even more fascinating. So far, on one side of the road, there was always that certainty of a river bed. Now nothing can be presumed or expected. At one instant, we are on the level of a dried bed of a rivulet and and within minutes find that we are at the top of a steep mountainside with a rock roof hanging precariously overhead. It is like sitting into a giant roller-coaster. Heavy road repair and construction activity is going on here. Just ahead, on a patch of road, a spluttering earth excavator is generating huge dust clouds of desert sand, but fortunately for me, no rock blasting is scheduled this morning. If there is rock blasting planned, the road could get blocked for hours and my plans to see Lamayuru Pooja ceremony would turn to be just a daydream. We are now entering into a narrow gorge. The steep mountain slopes on the sides, suddenly turn sulfuric yellow and porous as if some strong acidic bath has eaten away large chunks of rocks. The land looks just like the Lunar landscape images, released by American space agency. No wonder that this land is known as Moon land. Ahead of us, I see a small village on a mountain slope on one side of the gorge. In the flat land at the bottom of the gorge, there are lush green fields with patches of turmeric yellow flowers, of the mustard fields. Poplars and willows stand guard on the sides and far above of me, I see hanging precariously, on an outcrop of a mountain top, the Monastery of Lamayuru. The car stops and the driver announces that we have reached our hotel in Lamayuru. The hotel consists of few small buildings on a hill slope designed to match and suit the terrain. There are no railings for stair cases or such other safety features around. I find a patch of green grass , overlooking the gorge, with chairs arranged for sitting, near the main dining hall. I settle down and drink my welcome Tea. I am allotted my room, which is small yet has all basic comforts. The electrical power is available only from 7 PM to 11 PM and only for one or two hours in the morning. However the bathroom has a electrical boiler. I feel happy at the arrangements. I freshen up, pick up my camera and start moving towards the car. There is a fair condition road going up to the Monastery. The car drops me at the parking place near the Monastery. I would have to walk and climb, rest of the distance. 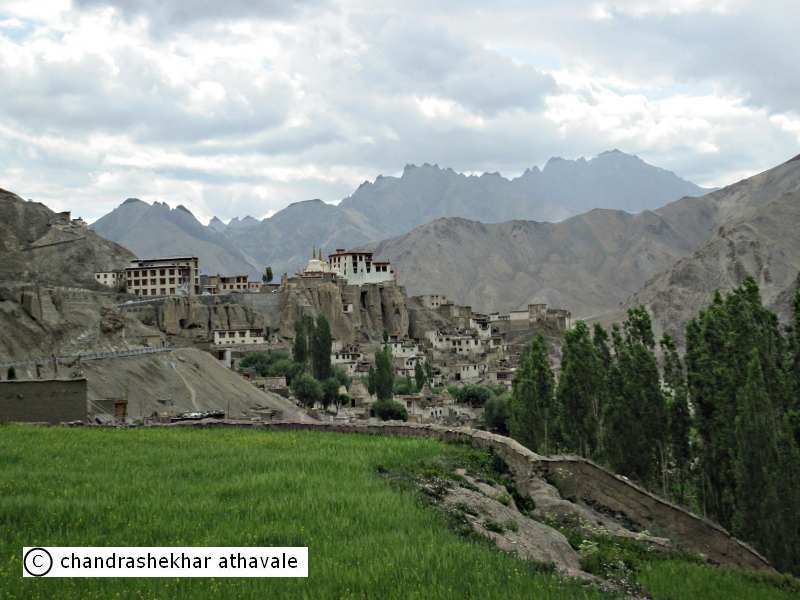 Lamayuru monastery is perhaps the oldest monastery in Ladakh and was a holy place even before advent of Buddhism in Ladakh. 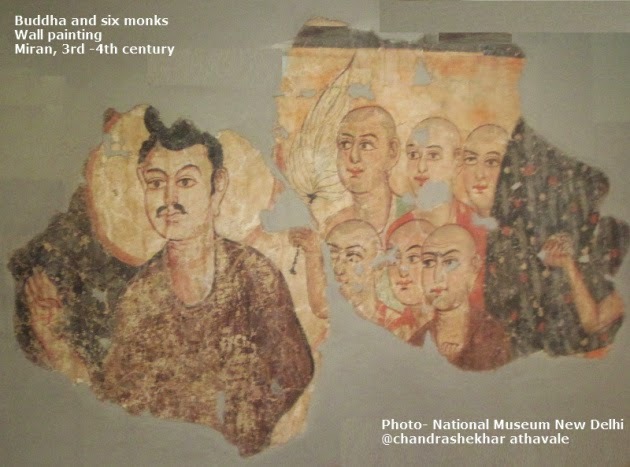 The history of Buddhism in Ladakh goes back to 10th or 11th century , when King Sron-tsan-gam-po of Tibet sent a great scholar Rinchen Zangpo to India to study Indian Buddhism and propagate the same to western Tibet or Ladakh. 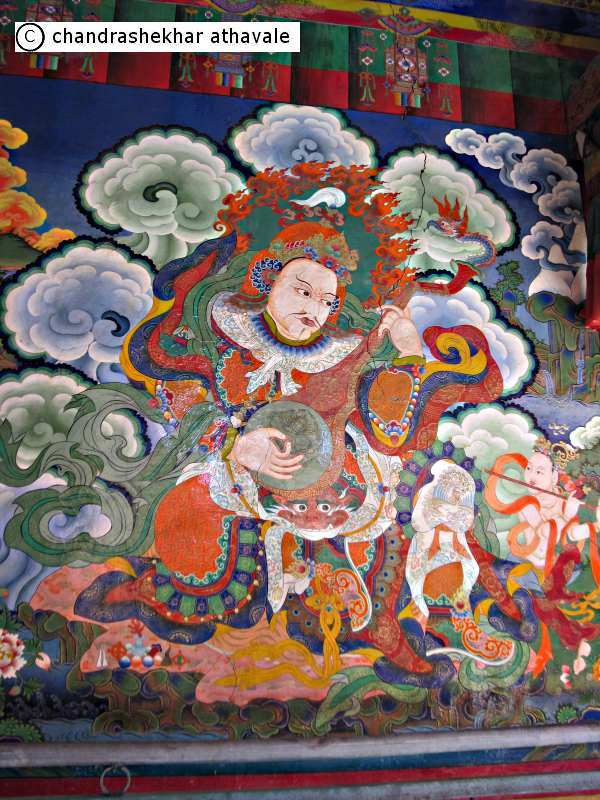 Lamayuru monastery is believed to be built by this Rinchen Zangpo. A long period after demise of Goutam Buddha, the religion of Buddhism was split in two schools of thought, known as Mahayana and Hinayana. 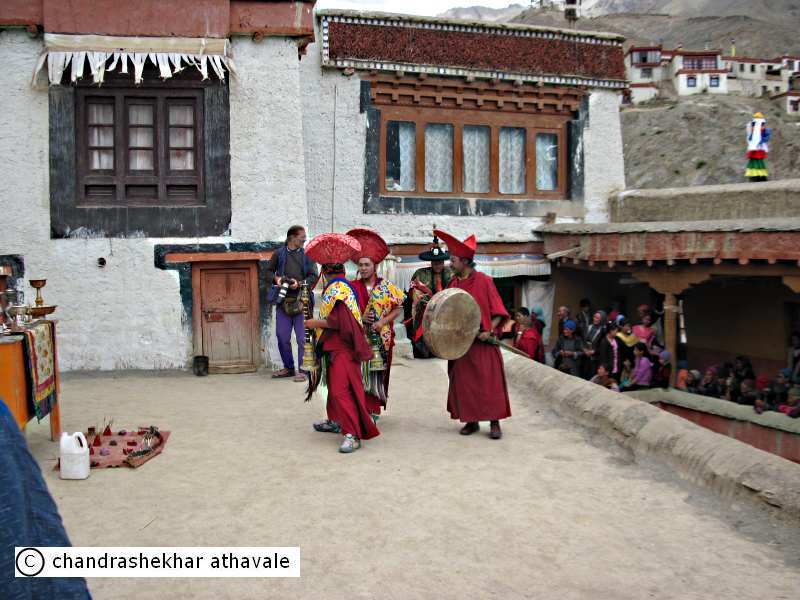 Out of this, Mahayana Buddhism is dominant in Ladakh and is further divided into four sects. 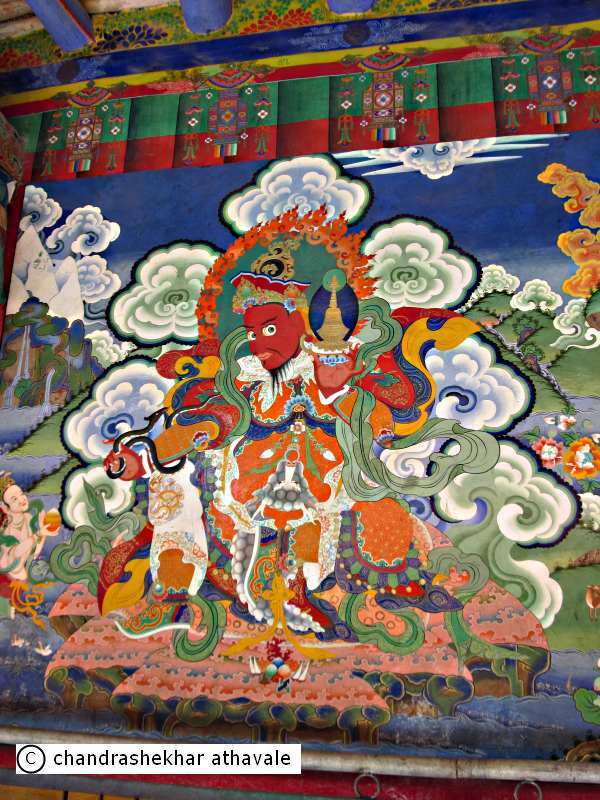 Lamayuru monastery observes the Drikung-pa sect. It is based on the teachings of Indian master Tilopa and his disciple Naropa and has elements of Hindu philosophy added to the original teachings of this sect. From the car parking area a narrow pathway leads to the Monastery. On one side of this pathway, there are buildings of residences for the monks. I climb the final few stone paved steps to enter the main building through a small wooden door. The main Monastery building has a small open courtyard in the middle. The side opposite the entry door has a veranda with wooden pillars to support the roof. A door in the rear wall of the veranda, leads to the main prayer hall or the Du-khang of the Monastery. 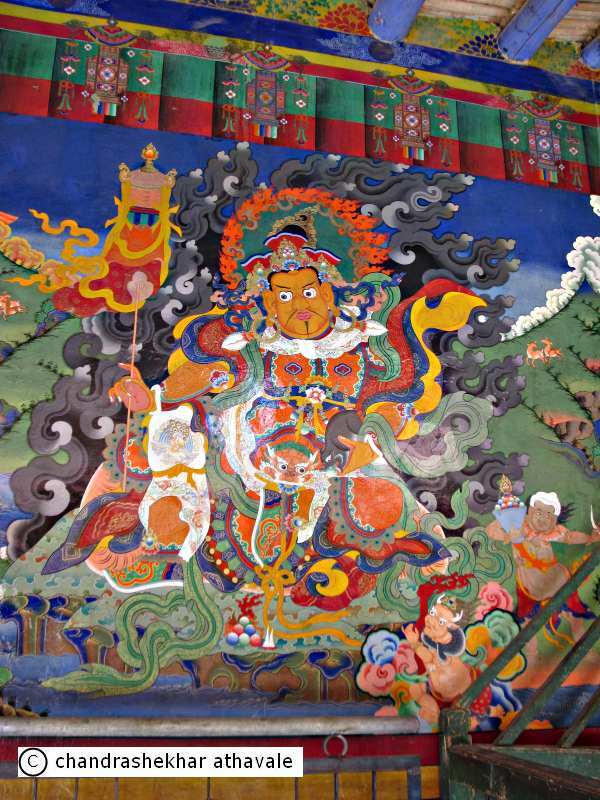 The veranda walls on the sides of this door are painted with bright coloured paintings of the four guardian kings of the cardinal directions and other paintings of religious significance such as Four harmonious Brothers and Wheel of Life. Inside the prayer hall one side is lined with a glass door cupboard, which stores old manuscripts on religion, law and ethics, stored in a neat and orderly fashion. There are three rows of low tables equally spaced along the hall. Religious attire and Pooja or worshiping accessories are all arranged on these tables. I also find the Dung-Dung drum and other musical windpipes used by the monks neatly arranged. Between the tables, there are carpets for the monks to sit and pray. 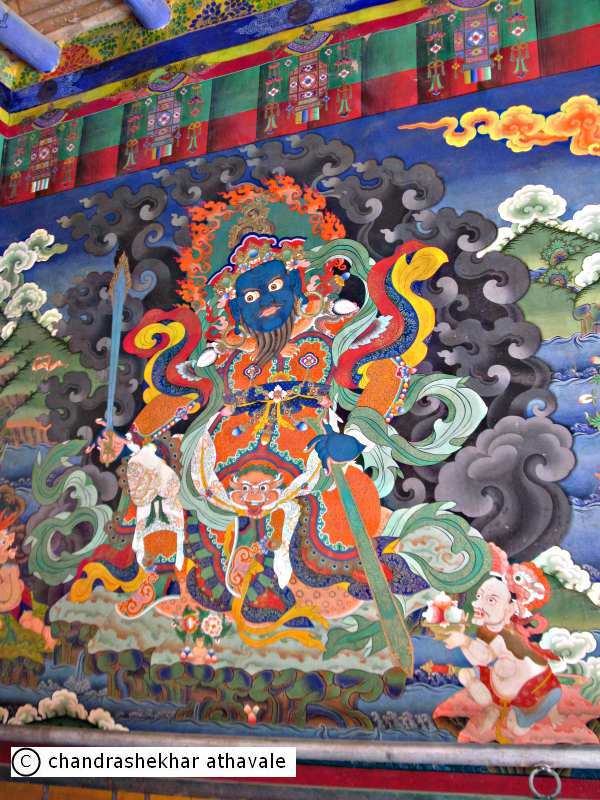 The main deity inside the Du-khang is Vairocana or the Illuminator, enshrined on a lion throne along with images of Dhyani Buddhas. I find an enormous mural of eleven headed Avalokiteshwara on one of the walls. 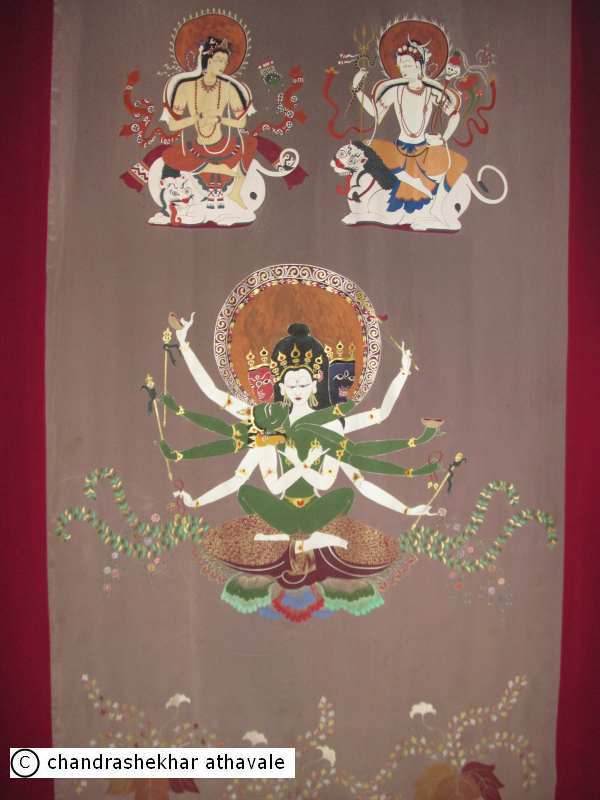 Just behind the main deity there is an inner temple which houses manifestations of Tara , the female deity of longevity and giver of wealth and children. I come out and climb the step to the terrace. 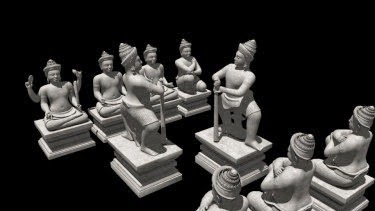 On a side, there is a small temple with some exquisite paitings and three silver Chhortens or Stupas. 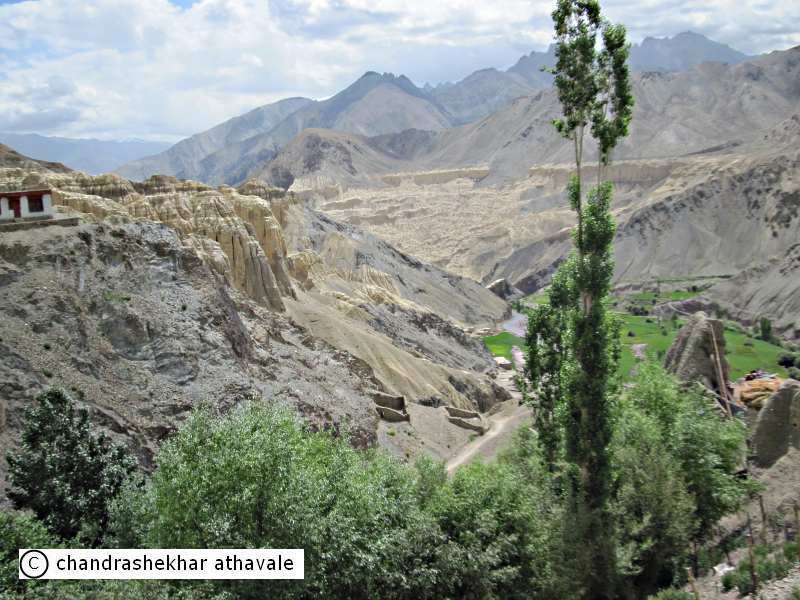 One can have a fantastic view of the entire Lamayuru gorge, village and the ever present mountains of Ladakh. I make enquiries regarding the Pooja ceremony that is supposed to be held this morning. No one knows for sure, but the general view is that it might be held between 12 AM and 1 PM. I look at my watch and realize that there is at least a gap of one hour for this Pooja to start. 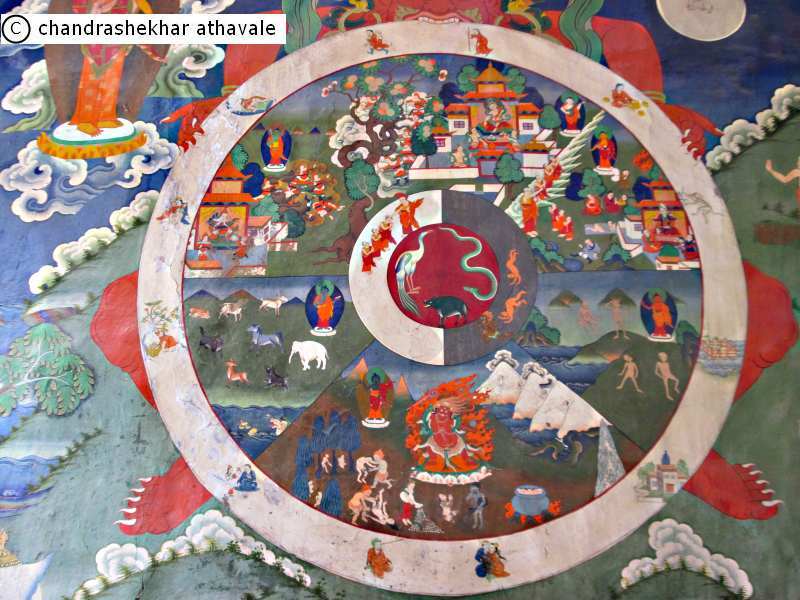 I go round the roof , rotating prayer wheels all the way. 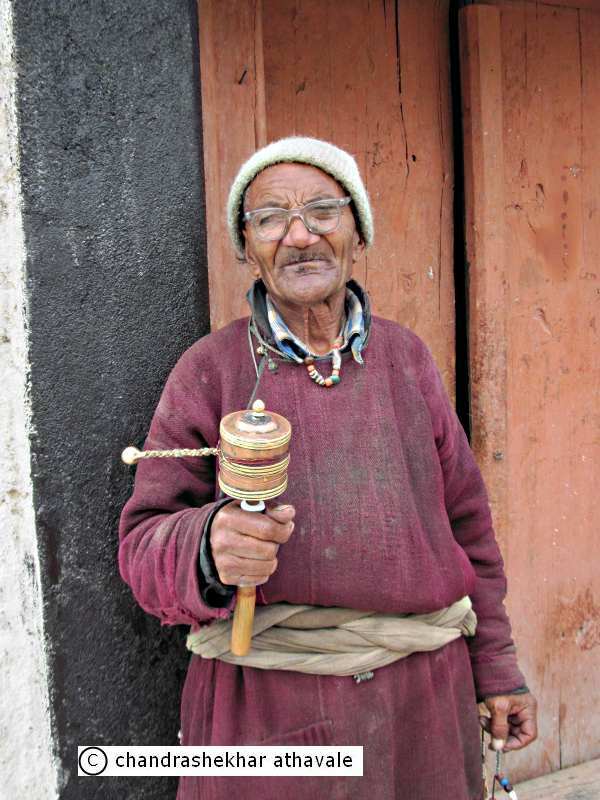 While I come down, I see an old villager with a prayer wheel. I take his photograph and give him some money for providing me with an interesting object for my photo. I find the old village of Laamyuru down hill on a side. I walk down and take snaps of few old and unused dilapidated buildings. Not knowing what to do next, I wander around the place. I find that there is a restaurant next door to the Monastery. I order some black Tea and relax in a chair. After an hour or so, I decide to make my second trip to the Monastery. This time, the place is full of villagers and few tourists like me. It appears that the main Pooja would be performed on the terrace. I climb up again and take a position of vantage. In the middle of the terrace, a table has been since arranged with Pooja utensils like bowls, water dispensers, and few consumables like oil and butter. On ground several objects made from wax have been laid out in sets of four. A band of musicians comes on the terrace from the side room. They are wearing very interesting looking red coloured head gear and long robes. The music starts playing. Now a row of priests with black hats adorned with skull like faces appears and stands at the edge of the terrace in front of the table. The music starts and the priests with black hats start reading from the old manuscripts. Four more priests with tall red headgear, stand on the four sides of the table, obviously praying to the four guardians kings of the four cardinal directions, Dhritarastra, Virupaksa, Virudhaka and Vaisravana. 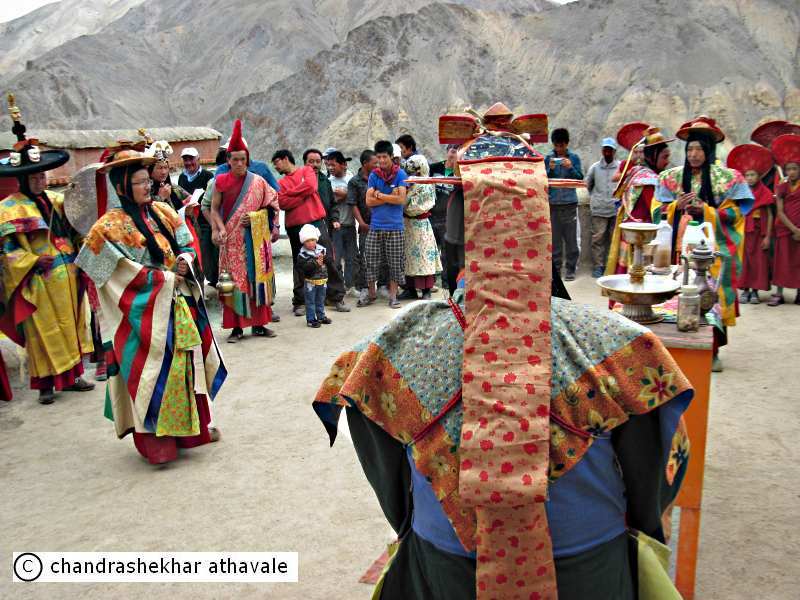 From what I observe, the essence of this ceremony is to offer various offerings in form of wax objects to the four Guardian kings of the cardinal directions such as Dhritarastra or Vaisravana, to ward off evil. When these wax objects are offered, they are thrown away in that direction. The Pooja ends and I return to the hotel for a simple but tasty lunch served with some hot soup. In the evening, I decide to walk to the end of the narrow gorge just opposite the Monastery. The view from here is again exquisite and bewitching. In front of me, there is the narrow lush green valley of the village. Behind me there are tall mountains only surpassed by even taller ice-capped mountains. 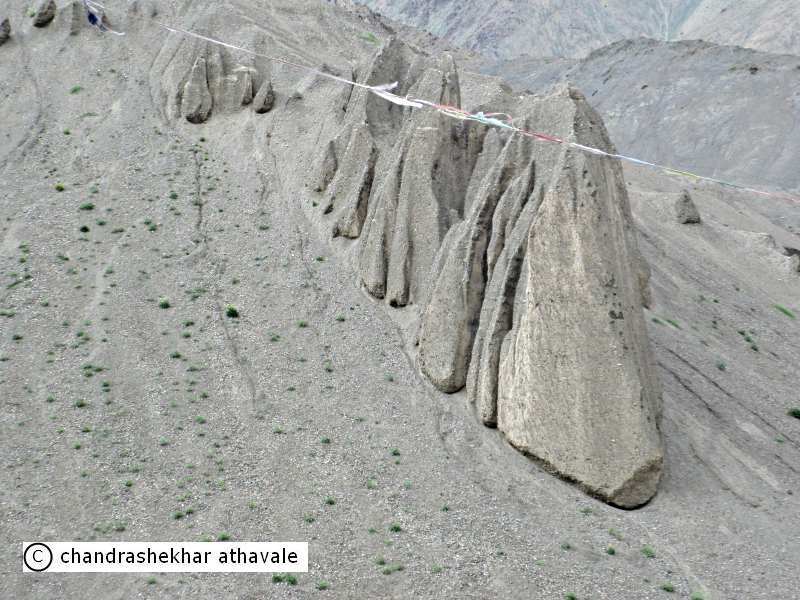 Strange and weird shaped rocks stand on the mountain slopes as if waiting for a call. As I am standing quietly, someone says ‘Hello’. I feel startled and look around. He is one of the local farmers and manages somehow to express himself in somewhat broken English. I start talking to him. He talks on many subjects. Life in the village, farming, weather. 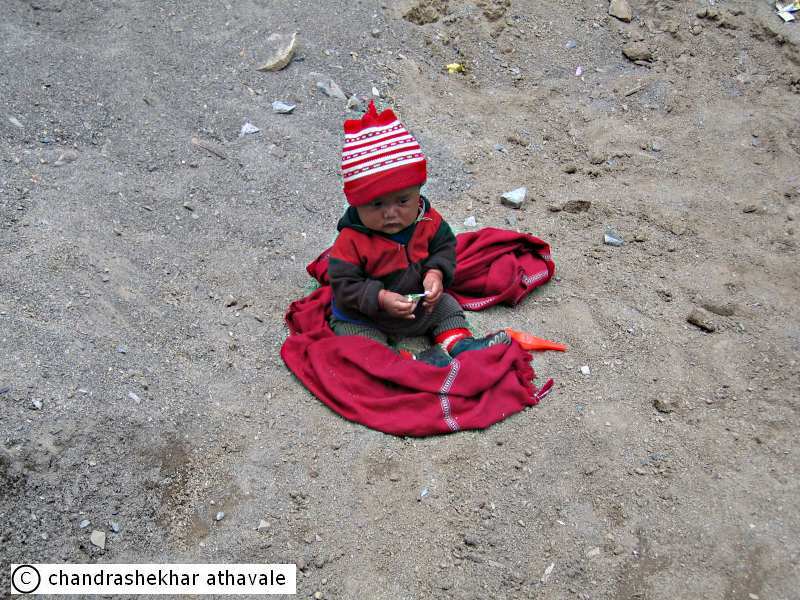 He asks me whether I have liked Ladakh? I ask him about the people of Baltistan, who live across the line of control, presently under occupation of Pakistan. He says, some people from there do come down here sometimes, but they are not well accepted here. After we finish our little chat, he ends it with a comment, that perhaps he is speaking too much, because today he had little more of his Chhang (an alcoholic drink) than usual. I laugh heartily and tell him that I enjoyed this little chat with him and return back to my hotel. I meet two German ladies, who have come for trekking in Ladakh. They have travelled widely in India as well as Asia. We talk about Cambodia and other places in Asia and also about their hometown in Germany. Satisfied with this social interaction, I decide to have my dinner. The dinner served in the dining room is sumptuous and very testy. 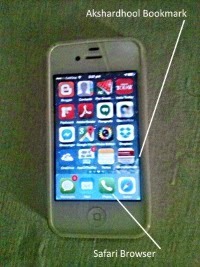 The night is much colder now, but the bed is warm and there is electricity to charge my camera batteries. I decide to retire to my bed.